In winter quarters at Camp Union, Fayetteville, western Virginia, Lt. Col. Rutherford B. Hayes of the 23rd Ohio watches white refugees from the Confederacy passing through, on their way west. Between the African-American escapees from slavery and the discouraged whites, it must seem to Hayes as if the Confederacy is being drained of its people. ELSEWHERE IN THE CIVIL WAR: From his headquarters in Cairo, Illinois, Brig. Gen. Ulysses S. Grant is gearing up for a major move against the Confederate enemy. He orders 150,000 rations loaded aboard a steamer which he will take with him for his assault on Fort Henry, which guards passage on the Tennessee River. Several hundred miles to the east, the U.S.S. Monitor, “the cheesebox on a raft” that represents the latest in naval warfare technology, is launched at Greenpoint, Long Island. At Southampton in England, Confederate envoys Slidell and Mason finally arrive, released after a month’s imprisonment in the United States in the Trent affair. Brig. Gen. Ulysses S. Grant is excited, which means he appears even calmer than usual. This curious ability of Grant’s—to act calmly in situations where fellow generals get excited—will manifest itself repeatedly throughout the war and contribute to his success. “Very much crestfallen” scarcely 24 hours before, Grant now sees the possibility of his leading a significant military action against the Confederates. His cautious superior, Maj. Gen. Henry W. Halleck, had just thrown cold water on Grant’s plan to attack and take Fort Henry, when, at almost the same moment President Lincoln issued his General War Order No. 1, demanding the Union’s generals go on the attack at last. Halleck has been trumped. In today’s message, Grant presses Halleck for a quick decision on the “permission” requested. He warns the Confederates will probably reinforce their positions soon and briefly points out some of the benefits of acting now, but concludes, “The advantages of this move are as perceptible to then Gen. Comd.g Dept. as to myself therefore further statements are unnecessary.” Clearly, Grant feels he has won his case. Brig. Gen. Ulysses S. Grant (right), commander of the District of Cairo, returns this morning to his southern Illinois headquarters from a fruitless audience in St. Louis with his immediate superior, Maj. Gen. Henry W. Halleck. Determined to carry the fight to the enemy, Grant wants to lead an assault on Fort Henry, the Confederacy’s gatekeeper on the Tennessee River. But Grant ran into a stone wall of obstinacy. Not only did Halleck display the extreme cautiousness that would become his hallmark, he met Grant with a lack of enthusiasm akin to McClellan's months earlier. In both cases, Grant’s unjustified reputation as a drunkard may have played a part. But in one of the sudden reversals of fortune that will dot the history of the Civil War, Grant gets encouraging news at Cairo: In Washington, President Abraham Lincoln has just issued General War Order No. 1 demanding—not suggesting, as hitherto—that his generals begin moving against the Confederacy. And the force at Cairo is mentioned by name as one of those he expects to get moving. In the wink of an eye, everything has changed—and Grant knows it. By telegraph, he fires off a terse message to Halleck: “With permission I will take Fort McHenry [Henry] on the Tennessee & hold and establish a large camp there.” Obviously, Grant thinks the shoe is on the other foot now. Halleck is cornered: Grant is a man with a plan, the esteemed Foote will support it, and the President is demanding action. And so…it will not be long before Grant, until now an obscure Western officer, will suddenly take the spotlight in the Civil War. Stay tuned. Since driving out the Federals two weeks ago, Stonewall Jackson’s Confederates have occupied Romney, a key point near the eastern edge of Unionist western Virginia. The Feds want Romney back. and the 67th Ohio is among the forces rushed from Camp Chase in Columbus, Ohio, to western Virginia to deal with Jackson. Capt. Marcus Spiegel is a company commander in the 67th. As usual in the army, however, it’s hurry up and wait. Tonight, Spiegel and 67th find themselves camped near New Creek, Virginia, and not doing much. Romney is less than 20 miles away, but Romney will be liberated without the help of the 67th, and Spiegel’s men will not see action for another month. Captain Spiegel uses the time to write “My dear and much beloved Wife and Children!” and tell them “I am hale and hearty and God only knows that I love you more than ever!” (A German immigrant, he has not adopted the more laconic speech of his fellow Midwesterners.) Spiegel relates the regiment’s peripatetic existence since leaving Columbus January 19th. 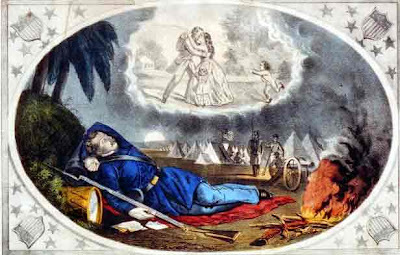 Flooding of the Ohio River prevented the regiment from setting up camp the first night of its journey. Instead, the soldiers had to spend the night in dirty freight and cattle cars. The next night, Spiegel’s men had hardly escaped from the inexorable train cars and set up their tents beside the track when the 67th’s colonel came along and ordered them move to another spot. The next day the men reboarded the train to spend 26 straight hours riding in the filthy cars with only one two-hour break. 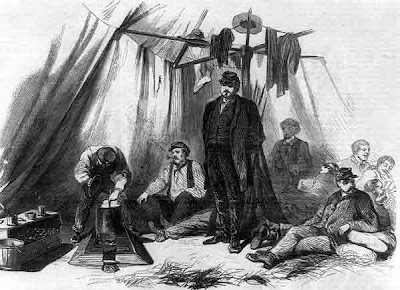 Finally, last Saturday, the men were allowed off the train and were given a hearty breakfast before setting up their tents on a branch of the Potomac River. All this activity has been demanding. “I never in my life have been kept as busy and constantly engaged. No place to write and no rest if I had [a] place, for [listening to] thousands of questions of the Boys.” The use of the word “boys” is significant. Many of the best commanders take a fatherly interest in their men, who feel warmest toward officers who take a nurturing interest in them. Andrew Altman is a 20-year-old farm boy from Damascus Township in Henry County, northwest Ohio, whose world until now has been limited the farm country of northwest Ohio and whose daily life has been labor in the fields relieved by an occasional fishing or hunting trip, more for food than recreation. Now he finds himself at sprawling Camp Chase near Columbus, ordered to guard some of the first Confederate prisoners the Union has taken in the Civil War He is fascinated by these strange creatures from far away. Penned inside a high board fence enclosing an area of about two acres, they are skinny, ragged, and angry. In a letter written yesterday and on its way now to his father, stepmother, and three siblings, young Private Altman writes, “I have been garding [secessionists]; we have got over three hundred here…. They are drest in [civilian clothes] mostly and raged. To a boy from a small, hardscrabble Ohio farm, army life almost seems luxurious to Altman: plenty of food and clothing, and the prospect of a great adventure, expected to end soon. As the war drags on, however, he will gradually change his tune. Mitchel is, in a phrase, yet another of the remarkable, colorful men in an army that is full of them. A gifted child, he was raised in Lebanon, Ohio, by a widowed mother, who left him to his books for as long as she could, but finally had to send him to work in a store, at age 12, for 25 cents a week. Mitchel entered West Point when he was only 15 and graduated in upper third of a class that included Robert E. Lee. After four years in the army, he resigned to become an esteemed professor of mathematics and science at what is now the University of Cincinnati. Professor Mitchel is one of those high-energy Victorians who could do many different things and do them well. He was a compelling speaker, a design engineer for railroads, and a commander in the Ohio militia. It was astronomy, however, that brought Mitchel his greatest fame. He raised money to build a planetarium, became a popular lecturer on astronomy, and wrote several books on the stars and the planets. In the summer of 1861, he jumped into the war as a brigadier general. The “astronomer-soldier,” as Mitchel came to be known in the army, will rise like a shooting star in the Civil War and fade away as quickly. For an uncommon man, his story will become all too common. Scratch, scratch, scratch, goes the pen of Brig. Gen. Ulysses S. Grant, as he spends much of the day in the headquarters of the District of Cairo firing off reports and orders in all directions. Grant is keeping up with business, because he has plans—and hopes. Today’s business consists of the routine matters that fill each day of a commander. By flag of truce, Grant writes to his Confederate opposite number on Columbus, Kentucky, Maj. Gen. Leonidas Polk, about prisoner exchanges. To Maj. Gen. Henry W. Halleck’s headquarters in St. Louis, Grant sends an inquiry about troop assignments, a reconnaissance report on the Confederates’ Fort Henry, and a list of officers available for service on courts martial. 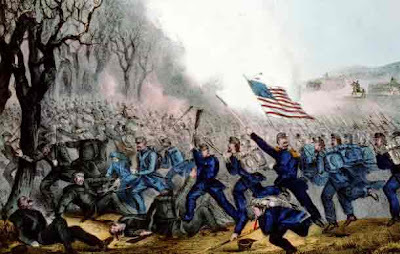 Orders go to underlings regarding the handling of freight, the management of prisoners’ property, and a squabble over who was in command—and of what—at Cape Girardeau. Congressman Elihu B. Washburne, Grant’s “patron” in Washington, gets a letter about supply concerns. Grant is ready to carry the war to the enemy in a big way. Will Halleck agree? But more prisoners come into camp, three arriving last night. One is a “Captain McVey,” a guerrilla leader who had tried to capture a citizen who was a Union loyalist. Catching wind of the plan, the Union man hid behind a log until McVey approached his house, then rose up to order the guerrilla leader to lay down his arms. Then the triumphant citizen marched the chagrined McVey at gunpoint to Hayes’ Camp Union in Fayetteville. ELSEWHERE IN THE CIVIL WAR: Federal gunboats slip down the Tennessee River, send a few shells into Fort Henry, and depart. It is a testing of Confederate defenses, and a foreshadowing of things to come. Lt. Col. Rutherford B. Hayes , now in winter quarters in western Virginia, is not a professional soldier, but he savors life as a volunteer officer in the 23rd Ohio Volunteer Infantry. On occasion he happily records how he hasn’t shaved in six or seven months and how he sometimes sleeps in his uniform (complete with boots and spurs). He revels in sunny weather and seems to greet each day with gusto. All in all, military service is a grand adventure for Hayes, who sometimes sounds like a Boy Scout on his first hike. But something is not quite right. That something is the anxiety his beloved wife, Lucy, home in Cincinnati, is suffering over his safety. Like most wives, sweethearts, and mothers, Lucy Webb hated seeing her husband leave for the war and she continues to be frightened over what might happen to him. 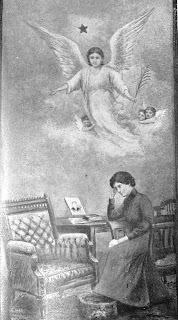 Moreover, she has been left to manage a household on a shoestring, raise the children—including a newborn—by herself, and cope with loneliness. And all the while her husband is enthusing about life in the army. It doesn’t take a psychologist to figure out that Hayes is feeling guilty about Lucy’s unhappiness. He feels reproved, albeit in a dream. Within a few days he will write Lucy that he has applied for leave to visit her at home. ELSEWHERE IN THE WAR: It is the “day after” for Union forces, east and west. In Ulysses S. Grant’s District of Cairo, a force is returning from a successful “demonstration” and reconnaissance against the Confederate base at Columbus, Kentucky. In southeastern Kentucky, Brig. Gen. George H. Thomas’s Union division is poring over the spoil of wars left by fleeing Confederates after their defeat at the battle of Logan’s Cross Roads (a.k.a. Mill Springs). In the Eastern Theater, a Union force under Brig. Gen. Ambrose Burnside has arrived off Cape Hatteras by ship and is threatening invasion of the North Carolina coast. is in position threatening invasion of the North Carolina coast. And, near Charleston, South Carolina, Union sailors are celebrating the successful blockading of the port’s shipping channel. Medical care was, in a word, horrendous, “more medieval than modern,” someone observed. Germ theory was unknown and surgical techniques primitive, meaning amputation was all too often the remedy of choice for wounds to limbs. The army medical corps was poorly equipped and organized, soldiers lived in filth, and boys raised on isolated farms had no natural defenses against the diseases carried to camp by city dwellers. The year before, a Gettysburg resident trying to sleep during a night-time interval between battles listened to the soft pleas of wounded Confederate, stranded in a no-go zone, for “Wahter! Wahter!” Retreating from Gettysburg, Lee’s wounded men cried out, “Oh God, why can’t I die?” and “Will no one have mercy and kill me?” as they endured teeth-rattling ride in ambulances lacking springs and cushions. Nor was there any well-organized system for notifying survivors of the loss of their loved ones. Company captains or other officers would write families when and if they could, but their letters were subject to the vagaries of the war-time mail system, and it could take weeks for the news to reach its destination. 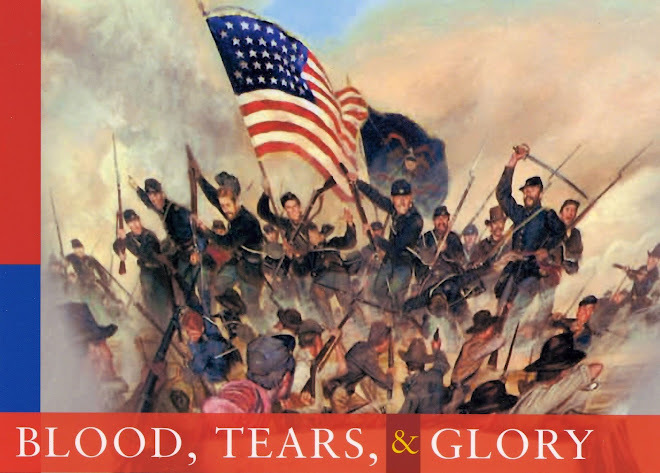 After the battle of Chickamauga in September 1863, it was two weeks before a surviving member of the badly cut-up 21st Ohio could notify his relatives of the death of their son, his cousin and a member of the same company. To the boy’s father, the soldier began a short letter this way: “It falls to me to write you the sad news of the death of your son. He died nobly while defending the old flag. He was shot in the breast and died almost instantly.” The rest of the short letter was a description of the battle. Other letters went to the boy’s mother (“a good soldier, I tell you we miss him”) and his siblings (“he was beloved by all the company and all who knew him”). And that, for the time being, had to do for the bereaved. If they were lucky, the family might retrieve the body, then or much later (in this case, they could not) and they might get his personal effects. In this case, all the soldier left behind was an overcoat, which the company lieutenant sold, promising to send the money to the family. Of Ohio’s 35,745 war dead, about 61% died from disease (of which, about 11% were prisoners of war) and about 33% died from battle injuries. (About half of those dying from disease died from intestinal disorders, primarily typhoid, from noxious water.) Of the remaining Ohio fatalities, 784 men drowned, 384 died in other accidents 34 committed suicide, 24 died from sunstroke, 23 were murdered, 6 were punished by execution by Federal military authorities, and 22 were deemed to have been “killed after capture” or executed by the enemy. About 5% of Ohio’s war dead died from a hodgepodge of other causes, or from causes unknown. ELSEWHERE IN THE WAR: In southeastern Kentucky, on this day, January 20, 1862, Union troops under Brig. Gen. George H. Thomas pursue Confederates fleeing from the battle yesterday at Logan’s Cross Roads (also known as the battle of Mill Springs). By abandoning most of their supplies (and the dead body of their general) on the north side of the Cumberland River, the frazzled Confederates finally achieve safety on the south side of the river. In winter's gloom and cold, the mood is not good, north or south, at home or in the camps. At the beginning of 1862, the region claimed by the Confederacy stretched 3,000 miles from the Atlantic Coast to the eastern boundary of California. The lower edge of Kentucky and the bottom third of Missouri fell within Confederate lines. All in all, the Confederacy controlled an impressive portion of the continent, its northern boundary, long, smooth, and uninterrupted from the Appalachians westward. But in the area lying between the Appalachians and the Mississippi River, that boundary is tissue-paper thin. The Confederacy simply has not placed enough troops in the area to securely hold it. Instead, like the Union, the Confederacy is obsessed with what could happen to Virginia, and especially to the Confederate capital of Richmond. In January, a Confederate force led by Brig. Gen. Felix K. Zollicoffer perched near Mill Springs in southern Kentucky and appeared threatening to the Union area of Kentucky. But Brig. 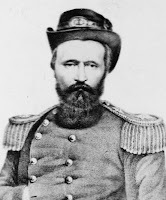 Gen. George H. Thomas spent 18 days slogging through rain and mud leading a Federal force, from Buell’s Army of the Ohio, south and by Saturday, January 18, was dug in, waiting for Zollicoffer to make the first move. Early today, on a foggy, rainy landscape a few miles north of the Cumberland River, the two forces collide, Zollicoffer attacking, Thomas counterattacking. Then, early in Thomas’s counterattack, one of the war’s strangest stories unfolds. Moving through a foggy, smoky, and rainy landscape, Confederate General Zollicoffer and Col. Speed Smith Fry of the loyalist 4th Kentucky Infantry, part of Thomas’s force, approach each other on horseback, coming so close the two riders could have shaken hands. The men, who are wearing long coats that cover their uniforms, do not recognize each other. Assuming Fry was one of his own officers, Zollicoffer gives him an order and Fry turns to carry it out. Apparently realizing Fry is an enemy commander, one of Zollicoffer’s officers fires at him, hitting his horse. Fry fires back, hitting Zollicoffer, and then a Union soldier shoots the general in the side. Zollicoffer falls from his horse, dead. Meanwhile, the rain is making it difficult for the Confederate soldiers to fire their primitive muskets. With their commander dead and their weapons failing, the larger Confederate force (about 5,900 men) is routed by the Thomas’s 4,400 men. On the south side of the Cumberland River, Zollicoffer’s superior, Maj. Gen. George B. Crittenden, orders Zollicoffer’s men to abandon the battlefield and most of their equipment and retreat across the river. And so the Confederates depart in confusion, but not without leaving behind some confusion for the history books. Originally, the Union referred to the site of the battle as Logan’s Crossroads, while the Confederates referred to it as Fishing Creek. Later, the battle came to be better known as Mill Springs, although the fighting took place nine miles away from that location. There are at least eight other names by which the battle has been known. Whatever its name, this relatively small battle (pictured above) has a much larger significance. It opened a hole in the Confederate defense line in Kentucky—and it foreshadowed even more serious problems for the Rebel nation. (Ohio units participating in the Battle of Many Names and the pursuit of the fleeing Confederates on the second day, include the 9th, 14th, 17th, 31st, and 38th Infantry, Batteries B and C of the 1st Ohio Light Artillery, and the 9th Ohio Battery. Nineteen-year-old Pvt. Liberty Warner of Company H, 21st Ohio Volunteer Infantry, keeps up a steady correspondence with the folks at home in Tontogany, a farm village in northwest Ohio. Like other soldiers, he yearns for letters from home, and to encourage responses, he sometimes resorts to crude sketches to fill out his own epistles. 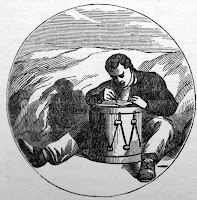 Sometime this month (Liberty occasionally loses track of dates) he fills out a letter to his brother listing fellow occupants of his tent, complete with a diagram of where in the tent the 12 men slept. The 12 men constitute a “mess” or grouping for feeding purposes. All the members of this mess are from Tontogany; all are members of Company H.
After the war, the surviving members of this mess can look back on the time they were only two degrees of separation from one of the most famous and flamboyant figures in the war, and, after the Battle of Little Big Horn, one of the most famous figures in the Indian wars. One of the 12 men from Tontogany is Thomas Ward (“Tom”) Custer, younger brother of none other than George Armstrong Custer. Born in eastern Ohio, the Custer family came to Tontogany in 1860. George graduated from West Point in 1861, entered the war immediately, and, for his remarkable leadership skills, in June 1863 will be named brigadier general, age 23. Thanks to demerits for his conduct, he had graduated last in his class at West Point, but he will become one of the war’s most outstanding cavalry commanders. Tom Custer entered the war as a mere private but in late 1864 will join his brother’s staff as an aide, with the rank of lieutenant. 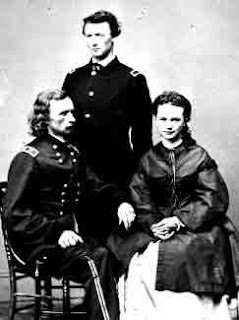 (Lt. Tom Custer, is pictured above, standing behind brother George and his wife, Libbie.) A daring fighter, Tom will win two Medals of Honor and repeated promotions. An admiring George will say of him, “Tom should have been the general and I the lieutenant.” Tom and another Custer brother will die with George at Little Big Horn. ELSEWHERE IN THE CIVIL WAR: Cooped up in winter quarters in western Virginia, Lt. Col. Rutherford B. Hayes complains to his diary, “How impatiently we look for action on Green River [and] at Cairo.” Green River lies within Don Carlos Buell’s command in Kentucky; Cairo refers to Brig. Gen. Ulysses s. Grant’s command further west. Both commands will see action soon, first of all in Kentucky, where Union forces under Brig. Gen. George H. Thomas are approaching Confederates in the vicinity of Mill Springs. In northwestern Tennessee, Federal gunboats begin a “demonstration” against Fort Henry, the Confederate fort built to deter an invasion of the western Confederacy via the Tennessee River. In Civil War terms, a demonstration is a show of force intended to deceive or distract the enemy or to gather information. At about the same time, a brigade of about 6,000 men sent by Brig. Gen. Ulysses S. Grant from his Cairo, Illinois, headquarters, is returning from another demonstration made in the direction of the Confederate base at Columbus, Kentucky. All of this is supposed to distract western Confederates and keep them occupied while Union forces under Brig. 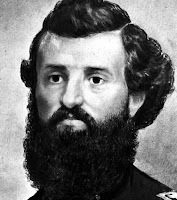 Gen. Don Carlos Buell come to the aid of Union loyalists in eastern Tennessee—a mission President Lincoln wants desperately. However, Lincoln's wishes will not be fulfilled, because Buell has other ideas and arrogantly assumes HE knows better than the commander-in-chief. Grant says the Columbus demonstration “if it had no other effect, served as a fine reconnaissance.” The Tennessee River demonstration was also useful. Federal forces learned they could land within two and half miles of Fort Henry without serious challenge. They also destroyed destroy an outlying Confederate camp. Previous feints up the Tennessee and Cumberland rivers had returned with considerable information about Fort Henry and Fort Donelson. With this information in hand, Grant is hopes to persuade Maj. Gen. Henry W. Halleck, commander of the Department of the Missouri, to let him attack the Confederates. He is waiting for Halleck to give him permission to go to his headquarters in St. Louis. Today, Cpl. Robert Caldwell of Elmore, Ohio, settles down to finish a letter to his mother that he began writing yesterday. He only had time that evening to tell her that he now weighs 170 pounds (the hungry times will come later). Then came the last bugle call of the night. The next morning, the men of the 21st Ohio and some other regiments in camp at Camp Jefferson in Kentucky donned loaded backpacks and began marching at half past eight.. They were going to intercept an enemy supply train, ran one of the many rumors, but, after marching only a mile, they came to a large field. They were going to have a sham battle! Robert told his mother in some wonderment. Military exercises simulating combat, common practice in the 21st century, were unusual in the 19th. Breathlessly, Robert writes that a company of the 4th Ohio Cavalry—his neighbors in camp—pretended to attack the infantry from one direction, only to wheel, retreat, and attack from a different direction. Meanwhile, the infantrymen were popping away with guns loaded only with powder. All the while, artillery pieces, pulled by horses, rushed “here and there wheeling and firing with empty guns, with terrible effect upon the imaginary enemy,” Robert wrote, quite impressed with it all. Thus the fight raged for upwards of half a day (the young soldier continued), when thinking that the foe had been sufficiently chastised for the present, with tired limbs but fearless hearts we changed our mode of attacks and charged upon our dinner with equal effect, and [then] were ordered back to camp, where we arrived without any further adventure. Thus terminated our first great fight in this part of Kentucky, I believe our loss consisted of one barrel [of] crackers, nothing more. 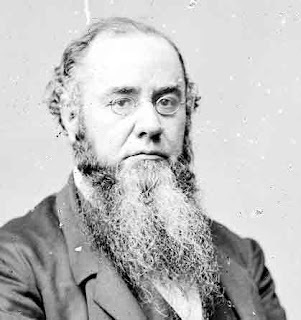 ELSEWHERE IN THE WAR: Confirmed by the Senate only yesterday, Secretary of War Edwin M. Stanton wastes no time in taking over the War Department with energy, enthusiasm, and little patience for corruption and inefficiency. Stanton discovers that the previous secretary, Silas Cameron, had left him “a rats’ nest” of problems. “We have had no war,” Stanton grumbles. “We have not even been playing war.” Things are going to change very fast. In southern Kentucky, meanwhile, a Confederate force led by Brig. 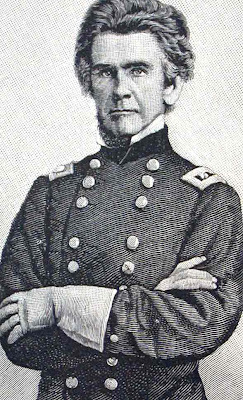 Gen. Felix K. Zollicoffer unwisely camps with their backs to the Cumberland River and facing in the direction of a rumored Federal force led by Brig. Gen. George H. Thomas, a loyalist Virginia and a man Confederates would come to know well, to their regret. Twenty-eight-year-old Cpl. 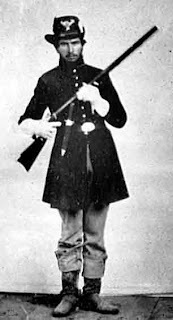 Alfred D. Searles, a member of Company H, 21st Ohio Volunteer Infantry, is in winter quarters in western Kentucky. Alfred frequently writes letters and he expects his family to do the same. Today he sits down to send his parents a common complaint. I take this opportunity…of writing a letter to you today to find out what we have done that we cannot have another letter from you. It is now over 3 weeks since we have heard [from you], but we shall write no more till we hear from home. Searles’ distress at receiving no mail is one of many examples, found in Civil War archives, of pleading by soldiers for news from home. Tired, lonely, dispirited bored soldiers yearned for reassurance they were cared for and not forgotten. Folks at home were just as anxious to receive letters assuring them their men were safe and sound. To pressure correspondents to send more mail, soldiers counted the letters they received, compared with the ones they sent. It would take quite a while before both sides learned that mail delivery in Civil War times was a chancey thing, with weather, bushwhackers, and military operations—not to mention weary horses—combining to delay and sometimes lose mail. But both parties kept trying, with soldiers unaccustomed to putting pen to paper scrambling to find writing utensils and struggle with the mechanics of putting sentences together while using a knapsack or drum for a desk. Montgomery Meigs, postmaster general in the Lincoln administration, came to the soldiers’ aid by introducing money orders and “soldier’s mail,” which required payment of postage from recipients rather than the soldiers, who not only had little money, but had trouble getting and keeping stamps. Time will tell if Corporal Searles’ comment is a prescient one. ELSEWHERE IN THE WAR: A Union gunboat on a reconnaissance mission sails up the Tennessee River almost as far as the Confederate fort called Fort Henry. It is worrisome omen for the Confederates. In Washington, the U.S. Senate confirms Lincoln's nomination of Edwin M. Stanton as secretary of war. It took the Senate less than two days from nomination to vote. Those were the days! He was a brilliant, short-tempered, stocky bully of a man, whose hard eyes staring out of a profusion of whiskers resembled a bear peering out of a briar patch. He was hard to like and hard to resist, and he had not only memorably insulted Abraham Lincoln years ago, he had kept up a drumbeat of criticism of the President in the first, difficult months of the war, proclaiming “the imbecility of this administration.” He was an Ohio Democrat named Edwin McMasters Stanton and today something amazing happens to him. This morning, President Lincoln, a Republican, tells his Cabinet that he is going to choose Stanton as his secretary of war, replacing the ineffective Pennsylvania politico Simon Cameron. This incomprehensible action—the President choosing a man who had insulted and criticized him bitterly and who was a member of the opposition party—is but one example of how Lincoln could see possibilities other men couldn’t. 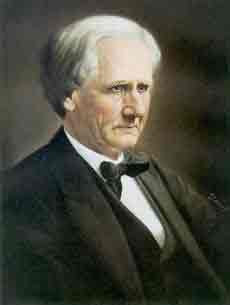 Stanton was a Democrat, but unlike many Democrats, he was strongly opposed to both secession and slavery. He had spent part of his time as attorney general under the benighted President Buchanan secretly subverting secessionist tendencies in Washington. But Stanton was a brilliant lawyer with a reputation for getting things done, no matter the obstacles, and he had two other things going for him: he was known to favor vigorous prosecution of the war and he had the support of Lincoln’s general-in-chief, George B. McClellan, who also was a Democrat. OTHER EVENTS IN LINCOLN'S DAY: An ad hoc council of generals, Cabinet members, Lincoln, and McClellan meet to discuss how to get the Union armies moving McClellan, his feathers ruffled by the meeting, rudely refuses to divulge his plans. Lincoln writes Generals Halleck and Buell in the West, urging them to action against the enemy and stressing a strategy of "menacing him with superior forces at different points, at the same time." While still deferring to the generals' superior knowledge of warfare, Lincoln nonetheless is displaying greater wisdom. And his patience is running out. Most of Siber’s men had been recruited in Toledo, Cleveland, and Chillicothe, but as many as 10 different Ohio counties were represented in the ranks. German regiments had a reputation for orderliness and efficiency and, like all new regiments, were hungry for action. Mustered in on October 2, 1861, the regiment had been ordered to the District of the Kanawha in western Virginia. After settling into winter quarters near Point Pleasant, almost within sight of Ohio, the men were expecting a long, dull winter. Suddenly, however, the regiment was ordered to undertake—all by itself—what soldiers called an “expedition.” An expedition meant you were venturing into dangerous country to see what might happen and perhaps to do some damage to the enemy. Last evening, Colonel Siber had been warned that 60 to 70 Confederate sympathizers had formed a guerrilla band they called the “Black Striped Company.” The 37th Ohio departs today on a long, hard march of 80 miles south to Logan Court House. They find trouble quickly. A detachment of four of the 37th’s companies, led by Maj. Charles Ankele, finds itself fired upon by “every house” on the opposite side of the unfordable Guyandotte River. When the captain of Company B is killed, however, the men can stand it no longer. They throw themselves in to the river, swim to the other side, disarm the residents, and take some prisoners. Colonel Siber reunites the various detachments he had sent out, and marches into Logan Court House after a skirmish between Siber’s scouts and number of bushwhackers and horsemen. One of the 37th’s corporals is killed. The enemy retreats to a nearby mountain that overlooks the town. Realizing he couldn’t hold the town “without more sacrifice of life,” the colonel orders his men to burn the court house and other public buildings the rebels had been using as barracks. Colonel Siber and the 37th will return to their winter quarters at Camp Clifton near Point Pleasant. He reports that, excepting one loyalist settlement, “the whole population in [the region traveled] are in the highest degree hostile to the Union.” It seems that western Virginia, for all its desire to the join the Union, still has plenty of enemies left in it. ELSEWHERE IN THE WAR EFFORT: Not only is Lincoln growing weary of generals who won’t attack when urged to, so are a number of important officers. They and the public can’t understand why McClellan’s well-trained and equipped Army of the Potomac is going nowhere. The officers met yesterday to discuss the problem and again today, this time with members of Lincoln and several members of his Cabinet. McClellan, who is still recovering from a serious illness, fears he is being undermined and drags himself to the White House to defend his command. Perhaps you shouldn’t call Simon Cameron a bad man, but it did seem as if badness followed him around. The vapors of a career politician rose from the man’s very pores. Which is not to deny that Cameron was talented man. Orphaned at nine, he worked and studied hard and at age 25 was able to purchase a newspaper in the Pennsylvania state capital of Harrisburg. He won appointment as state printer the next year, was appointed state adjutant general the year after that, and soon was buying railroad lines and making his fortune. Simon Cameron was one of those strivers who always seemed a little too lucky, a little too early, a little too successful for mere luck and hard work to explain. Simon Cameron was a politician. He knew how to arrange things, and as politicians always do, he had a wide network of those who owed him—and those he owed. No doubt about it: Cameron had a finely tuned sense of where opportunity lay. In his portraits (one of which is shown here), his sleek face and hard, agate-like eyeballs suggest a cat studying his next mouse. First elected to the U.S. Senate in 1884, Cameron eventually switched parties from the Democratic to the newly forming Republican Party. After making a deal with Lincoln’s managers (without Lincoln’s knowledge), he threw his support to Lincoln at the 1860 Republican National Convention, bringing Pennsylvania delegates with him. As reward, he wanted a Cabinet position in the Lincoln administration, so Lincoln reluctantly appointed him secretary of war. And that’s when the trouble began. Surprisingly, Cameron was not a team player in the Lincoln administration. A Radical Republican, he charted his own course, issuing anti-slavery dictates that embarrassed Lincoln. In the early months of the war, Lincoln could not afford to alienate slave owners in the border states and had to walk a fine line on the ticklish slavery issue...so Cameron was a loose cannon. It gets worse. All those hangers-on that Cameron had accumulated began claiming their dues, so War Department contracts were given to political favorites and military appointment handed out to friends. It was even worse than that: not only was the War Department corrupt, it was inefficient and ineffective. Something had to be done. Lincoln was able to ease Cameron out by offering him the post of minister to Russia, which would get the Pennsylvanian as far away from the war as possible. On this Saturday in January, Cameron makes public his resignation from the war department. Within 48 hours, Lincoln will announce his choice to replace Cameron. It will be a surprising, even shocking, choice, but one that will turn out to be one of his best decisions of the war. It involve an Ohioan.